For Appeal To Future, Romney's Rhetoric Looks Back Although Mitt Romney's stump speech has changed with time, one idea has remained constant from the earliest campaign stops. 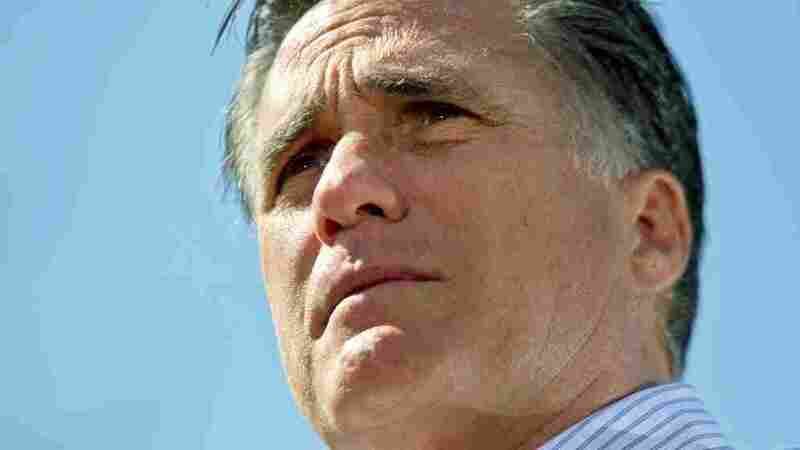 Romney invariably tells voters that he wants to "restore" America. 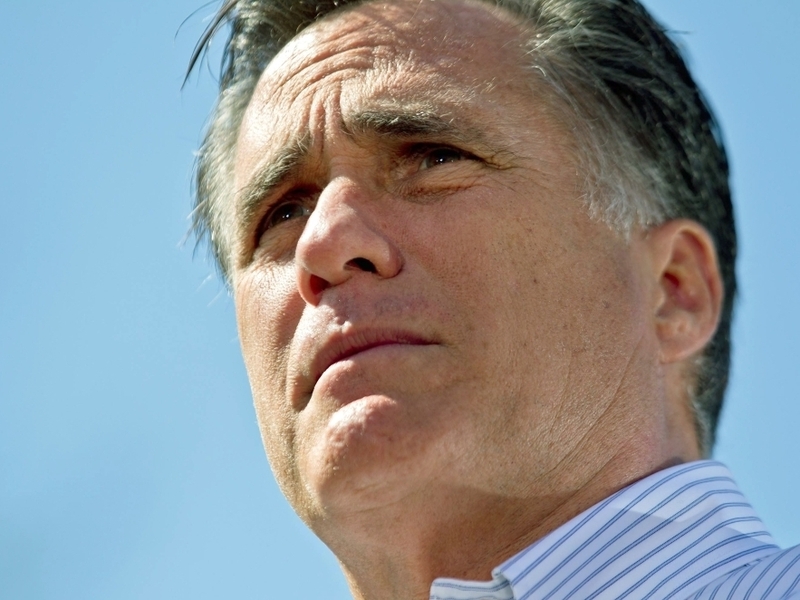 By talking about "restoring" the past, Mitt Romney hopes his campaign will have broad appeal. Here he addresses supporters during a campaign stop at Kirkwood Park on March 13 in Kirkwood, Missouri. Every good political campaign has a motif, from President Obama's "hope" to John McCain's "maverick." Mitt Romney's brand is still taking shape, yet one word finds its way into nearly every speech he gives. "I want to restore America to our founding principles," the former Massachusetts governor said in Iowa. "We'll restore those principles to this great country," he told a crowd in New Hampshire. "I don't want to transform America into something we are not, I want to restore America," he said in South Carolina. Romney's stump speech has evolved over the months. He rarely talks about amber waves of grain anymore. It's been ages since he quoted the poem that begins "Bring me men to match my mountains." Mitt Romney delivers his primary night victory speech in New Hampshire on Jan. 10, telling supporters he wants to "restore America." The theme of restoration, however, has been a constant from the beginning of his campaign. Romney aides say there was no one meeting where they decided to hit the "restore" button. It just felt like the right thing to say with the broadest appeal. "I think everybody could point to a time when America was better than it is right now," says senior Romney adviser Mark DeMoss. DeMoss argues that appealing to the past is a useful strategy when the present is bleak for so many people. "Whatever age you are, you can point to a time when our economy was better, or your housing situation was better, or going to college was a better situation, or values were more consistent with your values." The theme even extends to the superPAC supporting Romney — Restore Our Future — although his campaign is legally barred from coordinating with the group. Is The Past Worth Restoring? Yet restoration inevitably looks backward, and there are risks to that. Republican language consultant Frank Luntz remembers a campaign he did for the National Council of Mayors where the theme was "Taking America Back." "I had an African-American mayor from a major U.S. city come to me and say, 'That may work for the white population, but for the African-American population, taking America back reminds them of the '60s and segregation and the civil rights struggle,'" Luntz says. Words can take on different meanings based on the time, the place and the audience. Luntz quotes the Paul Simon lyric, "A man hears what he wants to hear and disregards the rest." "So when you define restoration or restoring America, it means something different to each person who hears it," he says. There are regional variations. In Massachusetts, Romney supporter Laurie Console says, "To me restoring America means that it's a place where the average American can still own their own house, put their kids through college, and not have to worry about retirement." 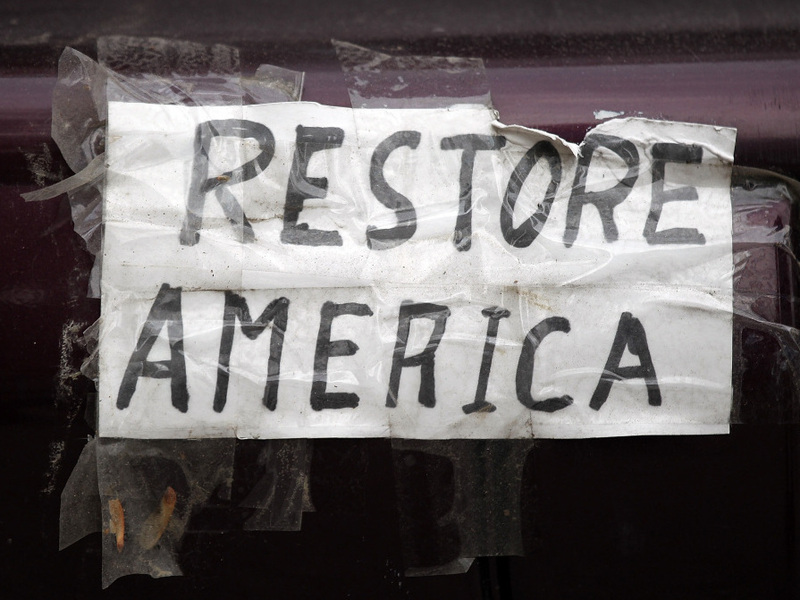 A homemade bumper sticker on the back of a car during a Tea Party rally in Concord, N.H., Romney appeared on Sept. 4. Yet down in Mississippi, Romney supporter Aaron Johnston thinks of social instead of economic issues. "I feel like we definitely need restoration of some good moral values in our country," he says. In politics, this is nothing new. Former Clinton White House speechwriter Jeff Shesol says the idea of restoring America is a well-worn theme. "It's usually Republicans more than Democrats who are looking to the past and idealizing the past, but you have heard the theme of restoration from Democrats almost as often as you have from Republicans in presidential races," he says. In 1932, Franklin Delano Roosevelt accepted the Democratic presidential nomination with a speech called "Restore America to Its Own People." Even this year, Ron Paul has put forth what he calls a "Plan to Restore America." Beyond politics, advertisers have known for years that nostalgia sells best when life gets scary. "It's a pretty traceable social phenomenon that, when times are tough, people like things that remind them of their past," says Mark Fitzloff, creative director at the advertising agency Wieden and Kennedy. "It feels good, it's familiar, it's comfortable." Even President Obama has appealed to the theme of restoring America, though he does not lean on the word quite as heavily. While Mitt Romney says he wants to restore the American sense of freedom, liberty and economic opportunity, President Obama says he wants to restore the American values of looking out for one another and, "We're all in this together."